Why do we appreciate patterns in art? Patterns are one of the most fundamental facets of art and architectural design alike. From the application of patterns in Ancient Egyptian and Celtic art, to the decorative and geometric patterns of Greek temples and mosques, the use of patterns in art is as old as art itself. This fixation with patterns in art has continued throughout history, and there are innumerable examples of famous pattern artists that have utilised them in recent times. From Andy Warhol’s famous Cow Wallpaper piece with regimented recurring cow heads, to Ian Davenport’s free-form Colourfall exhibition that featured a technicolour pattern of paints poured in straight lines, patterns are still the foundation of much contemporary artwork. Yet patterns, at their core, are just repetitive shapes. In theory, they should be far less popular than emotive paintings or thought-provoking installations, yet we find ourselves perpetually drawn to them. Why is this? One possible reason for our appreciation of patterns in art is that repetitive designs have been found to reduce stress levels. 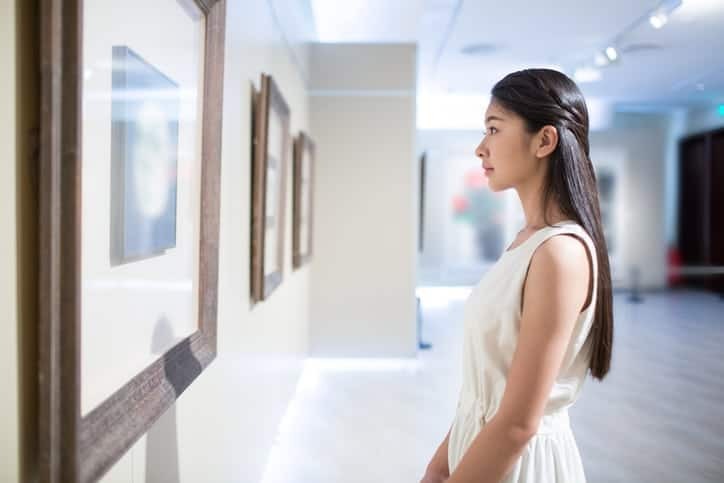 A study released in 2008 looked at the brain’s electrical activity when viewing fractal patterns in art, and found that doing so reduced stress by up to 60%. According to the Fractal Foundation, a fractal is a never-ending, infinitely complex pattern that is self-similar across different scales. Fractal patterns are common in both art and nature, with many of nature’s most notable objects being fractal. For instance, when you look at a tree, you not only see the large branches growing out of the trunk but the smaller twigs emanating from these larger branches. As you look closer, smaller and smaller branches appear, creating an archetypal fractal pattern. Other examples of fractals in nature include clouds, rivers, and mountains. Many renowned pieces of artwork feature fractal patterns, such as Leonardo Da Vinci’s famous Turbulence piece, Jackson Pollock’s poured paintings, and geometric patterns found in mosques. Collaborating with psychologists and neuroscientists, the researchers from the 2008 study discovered a universal effect they labelled as “fractal fluency” — common to patterns in art, nature and mathematics. According to fractal fluency, our visual systems are able to adapt and efficiently process fractals due to our continuous exposure to natural fractals throughout our lives. This means fractals are both easy and comforting to look at, which explains their stress-relieving effects. Our appreciation for patterns in art may be linked to our propensity for patterns in music. Repeating rhythms of stressed beats in music align to repeated patterns of shapes and colours in art. This appreciation of musical rhythm is supported by research. Cognitive scientist Andrea Ravignani conducted an experiment in which a group of individuals without any musical training created a piece of music that adhered to conventional rules of musical rhythm. The experiment demonstrated that our brains are naturally inclined to structured patterns in music. It is unclear why exactly our brains work in this way. Some have theorised that this is because our brains process sensory information in patterns, meaning rhythmic and visual patterns are hardwired into us. Others feel that repeated exposure to rhythms throughout our lives could condition us to enjoy seeing and hearing them. Whichever of these is true, what’s clear is that our appreciation of patterns in art, and in life more generally, is a part of our psyche.